Enstrom Helicopter Corporation continues its flight test program on the second TH180 helicopter flight test vehicle (FTV). Several test plans have been submitted to the Federal Aviation Administration (FAA).The TH180 is a new, two-seat training helicopter based on the Enstrom F28F. 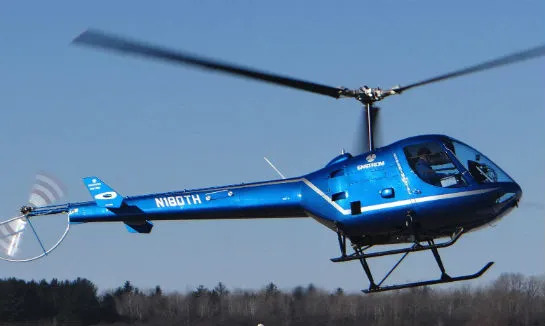 Enstrom Photo “The FAA has been providing excellent support and various tests are being completed,” the company said in a statement. Construction is nearly complete on a third FTV, which will be a fully conforming prototype. This aircraft will begin flight test in the last quarter of this year with certification anticipated in 2017. A certification meeting was held with the FAA in September and a familiarization meeting is scheduled with the European Aviation Safety Agency (EASA) in October to initiate the European Union certification process as the flight test program moves forward. “We are very encouraged by the cooperative efforts with the airworthiness authorities and look forward to completing certification flight testing by mid-2017,” said Orlando Alaniz, director of sales and marketing and co-program manager. The company said training future pilots is a high priority, and it is developing and building a training helicopter to meet the rigorous training demands of global helicopter markets.